Loblaws is a leading food and pharmacy company in Canada. It ranks amongst Canada’s largest retail companies. The company operates through a network of corporate and independent stores across the country. It also runs pharmacies in more than 1,300 Shoppers Drug Mart stores. The company has become a leading household name in Canada, which can be gauged from the fact that one billion visits are made each year to Loblaws stores. Post the spin-out of Choice Properties TSE:CHP.UN, Loblaws has two operating segments namely Retail accounting for 97% of revenues, (consisting of retail food and drug stores, in-store pharmacies and other health and beauty products, apparel and general merchandise) and Financial services (credit card services, insurance brokerage services, deposit taking services etc). Food retail is the larger business accounting for 70% of total retail revenues while drug retail constitutes the remaining 30%. Its brands such as President’s Choice, Life Brand, and No Name are three of Canada’s top 10 consumer brands. Loblaws is a core retailer with strong competitive strengths. The company is conveniently located to reach out to Canadians easily. More than 2500 of its stores are located within 10 km of 90% of Canadians. Its suite of products is also wide covering the entire value spectrum from discount to specialty. Over the years, the company has built a solid reputation, earned customer trust and has developed deep customer relationships. It enjoys No.1 market share in prestige, dermatology, and mass beauty categories with 400+ beauty boutiques. As Canada’s largest food retailer by revenue, there are plenty of opportunities for Loblaws to diversify in its food segment and cross-sell its products. Loblaws is targeting growth through a focus on core retail, healthcare and digital. Over the last decade, Loblaws has been evolving, and ownership of real estate is no longer its core strategy. The company recently spun out its 62% interest in Choice Properties REIT, transforming it into a pure-play retailer. As a result of the spin-out, a $640 million tax liability will be transferred directly to George Weston. The company is favorably placed to leverage its position as a leading Canadian retailer since grocery stores and pharmacy businesses are both very defensive. A large Canadian footprint, a network of retail stores, huge customer base and a large suite of products make Loblaws the undisputed retail king in the Canadian market. Loblaws last raised its dividend by 9.3%. The company sports a dividend yield of 1.8% and has compounded its dividend growth at 4.7% CAGR over the last five years. Moreover, a reasonable payout ratio of 30% grants enough room for future expansion. The company also has a share repurchase program in place. Loblaws has delivered strong EPS growth consistently and maintained stable growth in both retail and earnings margins. The company is strengthening its foothold in its core retail segment through strong investments and divestitures in this direction. On November 1, 2018, the company completed a reorganization, under which it transferred its 62% interest in Choice Properties REIT to its parent company (George Weston Limited). As a result of which Loblaws shareholders who hold distributed George Weston shares will receive a total 24% dividend increase. With a century’s old experience, Loblaws has developed a strong presence in the retail industry. It continually invests to improve the overall customer satisfaction which results in sticky relationships. Loblaws is growing its online presence through various digital initiatives, as consumers become more tech savvy today. The company is favorably placed to adapt in a dynamic and rapidly changing future. Investment in digital platforms integrates Loblaws’ network of stores to offer a more convenient shopping experience in apparel, pharmacy, and healthcare. Loblaws also has payments and rewards offering for its customers. All these efforts are directed towards increasing the customer base which should result in top line growth. Growing demand for food and medicines should act as a tailwind for this Canadian Dividend Aristocrat. A proven business model, an extensive store and distribution network infrastructure, and a reputed brand name form a deep moat around Loblaws’ business. Loblaws Companies is facing competition not only from the traditional brick and mortar stores but also from online players. Competition from e-commerce giants like Amazon.com getting into grocery delivery services is also rising. On the conventional front, Metro TSE:MRU competes with Loblaws. which is another leading grocery chain in Canada. Another contemporary is Sobeys through Empire Co TSE:EMP.A, which is the second largest food retailer in Canada. 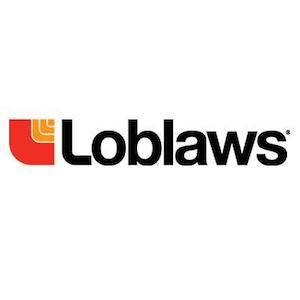 Loblaws provides essential and integrated services and therefore, enjoys a regular stream of cash flow. A coast-to-coast network of stores, most trusted brands, and diversified offerings in grocery, pharmacy, health and beauty, apparel and general merchandise have made Loblaws the undisputed leader in retail business. A regular stream of cash flows from a consumer defensive business and ongoing investments should support the company’s dividend growth streak in the future.